Responsive website design (RWD) is a web design approach that enables your website to respond to different devices regardless of the user’s screen. Responsive websites used to be about the “cool factor,” but today they are about being competitive. Companies that have responsive sites are taking the lead. Using a website that is non-responsive on a mobile device is like looking at a map from a mile away. And for customers, that’s an inconvenience. The average person looks at their mobile device 150 times a day, according to Tech Central. Mobile Internet usage is growing faster than desktop Internet usage. Globally, mobile web surfing has grown by 36 percent while desktop usage grew at a mere 10%. If your company website doesn’t utilize responsive design, you are ignoring the millions of potential users who could land on your site, while they’re on the go. Whether you like it or not more and more of your customers are using mobile devices to look at your website. Almost 70 percent of Americans now use their mobile devices, including smartphones and tablets for Internet searches. (Source: Pew Research) Considering this trend, it is important to note that people have a lot less patience when it comes to the Web. Your prospects are more likely to leave an unresponsive site than attempt to navigate it. Responsive looks good on anything. Responsive websites look great and work well, providing a continuity of experience for consumers when jumping from a desktop machine to a mobile device. 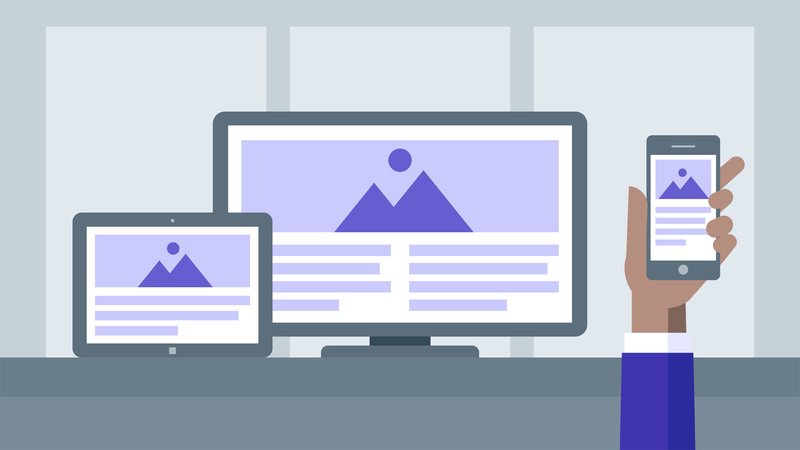 The greatest advantage of responsive design is that regardless of screen size, your site will look the way it is supposed to — from a smartphone to an 80 inch flat screen TV, you’re covered. RWD is not a phase. A great mobile experience is increasingly important. Users will be keep looking for a responsive site until they find one that works for them. According to a recent study by Google, 79% of people who don’t like what they find on one site will go back and search for another site. If you adopt responsive before your competitors, you have an important advantage. People visiting a competitor’s non-responsive site could easily end up on yours. It only takes a moment to leave an clunky old site and click to something better and faster. Google is on the record stating they favor responsive websites in search rankings. Search engines want to provide users with the most relevant search results, so mobile users in particular will be shown responsive sites before non-responsive ones. Since you no longer need two URLs, one for your regular website and another for your mobile site, SEO becomes easier. With responsive sites you only have to worry about SEO for one URL. Non-responsive websites will have an increased bounce rate because the negative user experience drives people off the site. As a result of the high bounce rate your site will drop in the rankings. Companies interested in saving time and money will love responsive web design. Responsive sites are less time consuming to maintain and they are easier to manage. Creating and maintaining one site is less expensive than creating and maintaining one primary website and a mobile site. You only need one site. As I mentioned above, gone are the days when companies rush to purchase a .mobi domain. During the height of the .mobi craze companies paid six figures for a single domain name. For example, in 2006 Flowers.mobi sold for $200,000. The .mobi domain was created to answer the need for mobile Internet consumption. Yet having two websites proved too complicated and expensive for most companies. So, with one site management becomes much easier.